U.S Deep Space 2 3 Jan 1999 3 Dec 1999 3 Dec 1999 Failure. U.S. MER A – Spirit 10 Jun 2003 4 Jan 2004 Last contact March 22, 2010. Mission terminated May 25, 2011. Last contact June 10, 2018. Mission terminated Febuary 13, 2019. For Mars Pathfinder, pressure was measured by a Tavis magnetic reluctance diaphragm sensor similar to that used by Viking, both during descent and after landing. The Phoenix lander in 2008 also carried a meteorological station. However, it carried a 26-gram instrument developed by the Finish Meteorological Institute. The device is based on the Vaisala Oy sensor technology and components for the instrument which was delivered by the Micro Analog Systems Oy and Selmic Oy. The Vikings were designed to only measure pressure up about 13.79 mbar. The Pathfinder was designed to only measure pressure up to 12 mbar. The Phoenix was limited to 5 to 12 mbar. None of these landers had equipment that could function right on Earth below an altitude of at least 68,000 feet - and that's figuring that the Tavis sensor would work past its designed 13.79 mbar level right up to 36 mbar. If they would not work right past 13.79 mbar, then the figure would be 81,000 feet above the Earth. The Tavis magnetic reluctance transducer works on the basis of converting pressure to voltage, with 0 volts at 0 mbar, 5 volts at 0.2 psia (about 13.79 mbar), which was its rating, and 15 volts maximum possible voltage allowed. After that its a real question of what would happen. The instrument was apparently designed to work well only with temperatures above -50 degrees Celsius, but it was regularly exposed to -78 C. Pathfinder was also exposed to -170 degrees Celsius at 80 km on its entry. LONGITUDE SYSTEMS IN USE AND MARS LANDING COORDINATES. 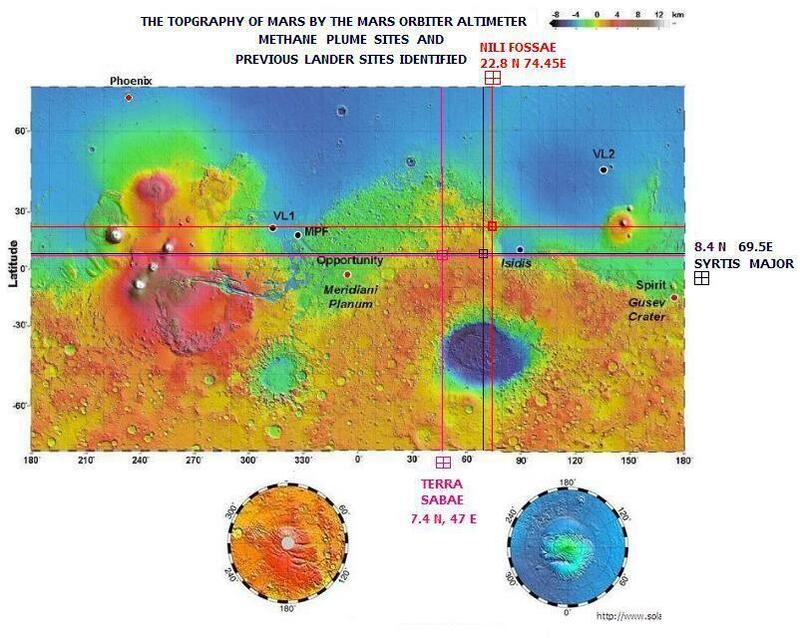 To find specific sites on Mars, you can now use Google Mars. The landing sites for Mars landers are given below, however the topography (MOLA) map included further below appears to use a different coordinate system for denoting longitudes. On Earth longitude coordinates are given from the Prime Meridian (0O) to 180O East or West. Phoenix was plotted by this writer, but for Viking 1, Viking 2, and PathFinder (MPF) there are West longitudes in excess of 180O. In the case of Viking 1 it looks like the 49.97O West correlates with the plotted longtitude of about 310 (360-49.97O West). (1) Planetographic latitude with west longitude. This is the coordinate system originally used in the Gazetteer of Planetary Nomenclature, and the system used for maps produced before approximately 2002. An ellipsoidal equatorial radius of 3396.0 km and polar radius of 3376.8 km are assumed. (2) Planetocentric latitude with east longitude. This is the coordinate system used for maps produced after approximately 2002, although the planetographic latitudes and west longitudes are also shown on printed maps for reference, and the radii on which these are based are different (3396.19 and 3376.20 km).